The Kruger Park is renowned for its incredible biodiversity and rich cultural history. 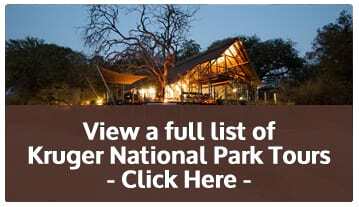 This 6 day tour offers you ample time to explore the southern region of the Kruger Park and provides a glimpse of the vast wilderness. national park and its incredible animals and birds, including the famous Big 5. Guests stay in spacious 2-man Meru safari tents that are equipped for comfort and convenience. Dining under the stars around a camping firepit makes it an authentic safari experience.